Posted by heldveld in Blog Spotting, Christian Education, Christian Parenting, J. Gresham Machen. They love God and love their children too much to allow Christian instruction to be tagged one day in seven as a kind of excrescence upon an education fundamentally non-Christian. They have tried to make the education of their children Christian throughout. God has wonderfully blessed them in that effort. A good note of encouragement to a parent who has just decided to invest in Christian Education for his children. Posted by heldveld in Book Reviews, Christian Education, Christian Parenting, J. Gresham Machen. 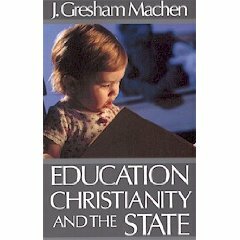 This book is a collection of articles and addresses by Machen on various topics of education, the state and how Christianity relates. They are all quite interesting even though there is some repetition due to the fact that he spoke on the same subject (the establishment of a Federal Department of Education) to different audiences. Despite the fact that the book is composed of separate compositions it flows well and keeps you interested in mining more of his thoughts on the subjects addressed. The first essay ‘Faith and Knowledge’ lays the premise for the rest of the book- that Christianity is not anti-intellectual and the separation of knowledge and faith has been disastrous. After all as he points out how can you have faith in something or someone that you know little to nothing about? The Christian religion is based on facts not feelings or philosophies. Since knowledge is crucial to the Christian faith education and, by default of our society, government’s involvement in educating our children are issues the Christian should address. ‘The Importance of Christian Scholarship’, which follows, was probably my favorite address in the book. It discusses the importance of scholarship in three areas; evangelism, defense of the faith and building up the church. It again builds the case for why Christians should be concerned about education. What better environment for cultivating this enthusiasm while consecrating these endeavors to God than a Christian school? While I appreciated his analysis of situations in the book I was really hoping for a bit more of a blueprint for how Machen envisioned Christian education occurring. Obviously Westminster served to address his vision of seminary education, but what should we expect for our young children? In other chapters Machen explains the need for the Christian school as a way to preserve liberty and propagate the faith. One of the essays is even titled ‘The Christian School: The Hope for America’. Some may find it interesting that Machen does not want prayer or Bible teaching in the public school as he believes that the truth would be distorted. He also does not want the public schools to teach morality as he sees that morality can only be based on God’s truth. He has some good points there. As mentioned earlier quite a few chapters deal with his opposition the establishment of a Federal Department of Education. It is particularly interesting to read the actual transcript of his testimony before the House and Senate. He sees this department as a threat to our liberties and also fears that the standardization of education will be disastrous. In the final address Machen lays out his purpose and plan for Westminster Seminary. This is a great book for exploring Reformed thought on the social issue of education. This is the first book by Machen I have read but will definitely put his classic ‘Christianity and Liberalism’ on my to read list. It is available from Reformation Heritage Books.